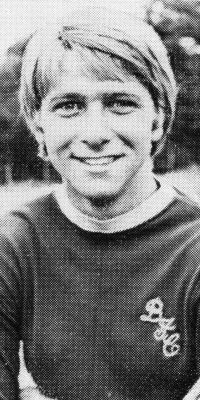 Recollections of Burnley's FA Youth Cup success of 1968 will always throw up the names of Mick Docherty, Steve Kindon and Mick Docherty, but there were other very influential players in that team, none more so than midfielder Alan West. Burnley fought off Manchester United to secure the signing of the Hyde youngster and he arrived at Turf Moor as an apprentice in the summer of 1967. He was just 15 years of age at the start of the season as the Youth Cup was lifted, playing in a midfield alongside Eric Probert who was even younger than West. As the campaign went on, more and more were taking notice of West and as he stepped up into the reserve team he continued to impress such that he won his first professional contract on his 17th birthday some seven months after the trophy had been won. That was in December 1968, but West had a wait before he got his chance in the first team. That chance came at Easter 1970 when he lined up against Stoke City in a First Division game, a game that is perhaps more memorable for the guard of honour Ralph Coates received ahead of kick off following his selection in the England World Cup squad. The 1970/71 season was a difficult one for Burnley and a difficult one for a young player to try and establish himself. The club suffered relegation after a 24 year stay in the top flight but West got a place in the side in September and played in fourteen successive games, scoring his first goal in a 3-2 home defeat against Huddersfield. Unfortunately, an injury cost him his place in the team after those games and he didn't feature again that season. That all changed when we dropped into the Second Division. Manager Jimmy Adamson saw West as a key player and he became very much a first choice in the team. His form was outstanding and it didn't go unnoticed elsewhere and at the turn of the year he won a place in the England Under-23 team. He was selected for a friendly against Wales in January 1972. Over 18,000 were at Swindon's County Ground to see him play in a winning England team against a Welsh side that included two of his Turf Moor team mates, winger Leighton James and goalkeeper Jeff Parton who himself had recently made his first team debut for Burnley. England won the game 2-0 with Malcolm Macdonald and Mike Channon getting the goals, but the game was not so much the start of West's international career but also the end. The end of his Burnley career wasn't too far away either. A month later, during a 2-0 defeat at Birmingham, he was substituted with Arthur Bellamy, in his last season at Burnley, replacing him. Bellamy kept his place for a few games but when he too was left out it was Probert who came in. West didn't feature again that season and the season that followed must have been a massive disappointment for him personally as Burnley triumphantly returned to the First Division. West made just two substitute appearances that season in the league and by the summer of 1973 he decided that he would have to move to get some first team football. That move took him to Sunderland in a £70,000 transfer just as the new season was kicking off, or so it seemed. Everything was done; West said his goodbyes and was training in the North East when he was hit with a bombshell. The medical had shown a back problem and it was problematic enough for Sunderland to pull out of the deal. He was back at Burnley but for just two months when Luton came in and signed him for £100,000. He was an immediate hit at Kenilworth Road and a year after sitting on the sidelines as his team won promotion he was this time very much in the team as Luton followed suit and joined Burnley in the First Division. They stayed for just a season but West remained there until 1981, playing in the Second Division. It was a busy time too. He didn't just play for Luton but also enjoyed four summers (1976 to 1979 inclusive) playing for Minnesota Kicks in America and was in the team that reached the final of their national cup competition. During his years there he played alongside two others who wore the Burnley shirt, Willie Morgan and Ron Futcher. In under eight years at Luton he played not far short of 300 times in the league, captaining the team for many of those games too. The summer of 1981 saw him finally leave the club and he played two more years of league football with Millwall before calling it a day. His playing career came to an end in non-league football with Baldock Town but by then Alan West was very much building a new career for himself as a church minister. Life hasn't always been plain sailing and in 2004 he fought off non-Hodgkins Lymphoma and the five years later, when he looked to have beaten it, suffered a re-occurrence of the illness. Back to health, he is currently the Senior Pastor at Luton Christian Fellowship and is also the club chaplain at the football club. He's still very fondly remembered by the fans at Luton where he was considered something of a legend and he received a superb reception from them when he was guest of honour at their away game against Hyde, his home town club, in August 2012. He was never a legend at Burnley where he played just over 50 league and cup games before moving to Bedfordshire but I always thought we'd need to have a hell of a side if we could dispense with the services of Alan West. The thing was, we did have a hell of a side.